Home » Giveaway	» Gifting & Deals! First, a SPECIAL DEAL: get 85% off your entire purchase of $24.95 or more. * This coupon is applicable to my Ravelry and Etsy stores. Offer runs 4 days only and expires November 26th, 2018 (11:59 pm PST). And now, it’s a GIFTING TIME! 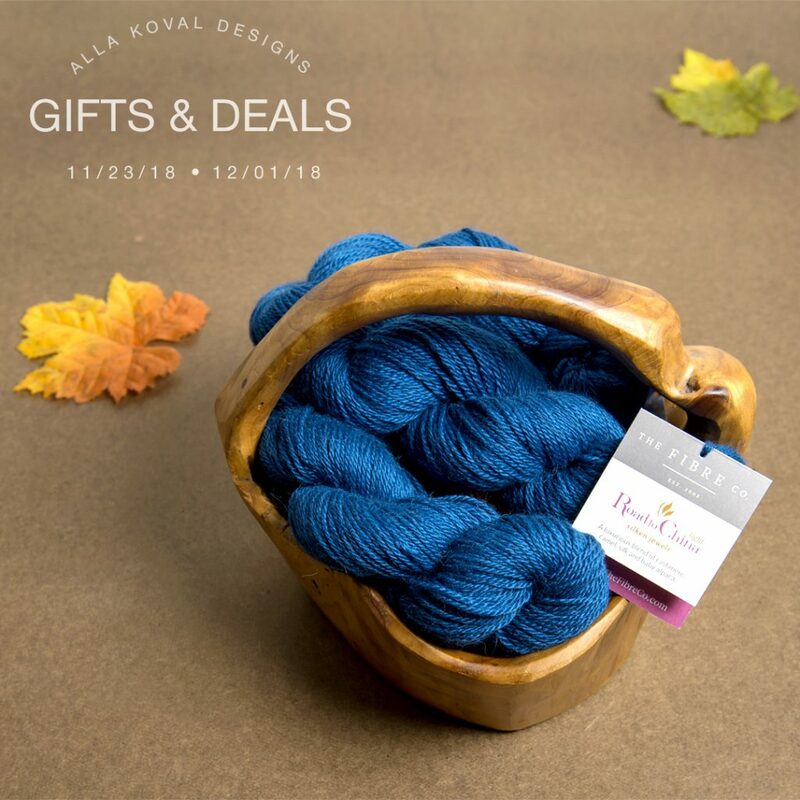 One lucky from anywhere in the world will win 3 hanks of such luxury and one of my new favorite by The Fibre Co. Road to China Light (65% baby alpaca, 15% silk, 10% cashmere; 159 yd [145 m]/1.75 oz [50 g]; Sport weight) in colors of Your choice! ‼️OR GET $50 GIFT CARD instead of yarn! ⠀ • Optional Entry # 2: Blog about this gifting and leave another comment to this post with a link to your blog post. ⠀ • Optional Entry # 3: Live comment on Instagram, my FB page, share this post on any of your accounts: Instagram, Facebook, Ravelry, Twitter, Yahoo, etc., leave one more comment on this post (if possible, with your link, but here is no any obligations). You also can just share my original blogpost. Share on more networks for more entries! (one additional entry per one network). ⠀ • This contest starts today, November, 2018 and will end on December 1st, 2018 at 11:59pm PST. ⠀ • I’ll select the winner with random.org’s random number generator. A Winner will be notified by email on Monday, December 3rd, 2018. Good luck everyone and lets the fun begin! 21 Responses to Gifting & Deals! My favorite holiday has always been Christmas because everybody gets a gift. excited to enter your drawing! My favorite holiday has always been Christmas. That is the most beautiful blue yarn I’ve ever seen!! Alla, so good to get an email from you! Was wondering what you’ve been up to lately….OK…I’ll say Halloween….!!! I’ve missed your emails, haven’t received any of your previous posts so I’ll read them in a minute! my most favourite xmas would be the christmas memory of last year with my father. He passed away this year so this one will be tinged with sadness so maybe it’s time to start a new Christmas family tradition. I wish you and your family well this season, plenty of hugs all round and look forward to seeing your direction in the new year. Thank you for the chance to win some beautiful yarn! And Christmas Blessings to all! We only have two so i don’t really have a favorite holiday. My favorite holiday is Christmas …although I’ll admit I loved it more when the children were younger, they make it what it is..the children. Now that I am older it still remains my favorite holiday mostly through memories! My favorite holiday is Christmas, every thing about it! My favorite holiday is Christmas. Thanks for all the hard work you put into your patterns. Mine is Christmas, can’t wait for this one! Thank you Alla! My favourite holiday is Victoria Day (a.k.a. May Long Weekend). There are so many fewer obligations than a lot of the commercial holidays, the weather is nicer, and it’s the start of gardening season. But I do like Christmas too, especially when I can spend it with my family. + 6 comments on Instagram and 1 on FB.